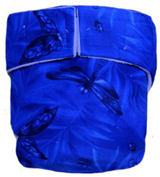 Pocket nappy, supplied empty, so any insert can be inserted for absorbency. Minkis and Slinki Minkis - LAST FEW TO CLEAR! Pocket nappy, supplied without inserts, means any absorbent nappy/insert can be inserted for absorbency. Not strictly a pocket system, this is essentially a popper fastening wrap with inner pads that poppers on to make a one-piece nappy, but separate for speedier washing and drying. Classic Snap comprises Polyurethane laminated polyester (PUL) outer, D'Lish has soft polyester Minkee velour outer, both with inner polyester fleece lining, so no PUL touches skin, plus 2 pads that popper in for good absorbency without bulk. Outer dries quickly, inner pads are soft knit bamboo /organic cotton which is slower than cotton to dry. One of the pads is topped with polyester fleece to wick moisture away, but either pad can be placed next to baby. Made in Australia, D'Lish made in China. 2 sizes usually required from birth to potty.